Editor’s note: The crisis in Aleppo has made headlines this week, but our support of Syrian refugees began long before that. While we show up for people in emergencies—as we’re doing in Aleppo right now—we refuse to walk away once the immediate danger has passed. Our empowerment programs provide the resources and tools people need to rebuild their lives. Many of the people participating in these programs are Syrian refugees, now living in Iraq. Sameeha is one of them. She is a perfect example of why we don’t stop at emergency relief or settle for only giving people handouts. Sameeha lives with her elderly parents, brother, and sister in a small cinderblock house on one of the main streets of a refugee camp in northern Iraq. They once had a very different life in Damascus, Syria. That was before the civil war, before ISIS, before everything turned upside down—forcing them to flee from one war zone to another. In many ways, they’re just like the 4.8 million other Syrian refugees who have fled during the violence and with numbers that large, it can be hard to see beyond the statistics. But if you slow down, and look for Sameeha’s red and white polka-dot door, you’ll see into a life that is probably not what you expected for a woman who spends her days in a refugee camp. Sameeha is a woman with vision. She accumulated years of experience as a designer, business owner, and teacher in Damascus. And she knows what she wants to do with it. Back home, Sameeha worked at a factory making embroidered bedding sets. She designed the fancy sheets, bedspreads and shams that were used in expensive homes and by newlywed couples. She had a team of women who worked under her, executing her designs. Later, she opened her own dress shop, featuring her own designs alongside those requested by her clients. Customers came from all across the region for her dresses. But then the war came, and it was too dangerous for Sameeha and her family to stay. So they left everything behind—her career, her livelihood, her future—and fled to Iraq. Living in a refugee camp is hard. But instead of crushing her dreams, it’s serving as fuel for them. 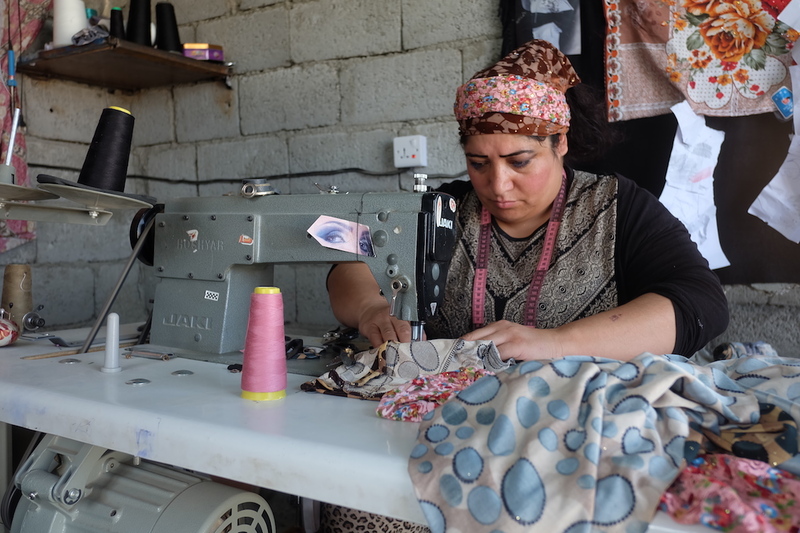 Sameeha took the first small step when you provided a small business empowerment grant, enabling her to open a shop in the camp offering seamstress services. She developed her own catalogue to show clients sample designs and embroidery details. And she is always dreaming up new dress designs. But even as she works through a basket of fabric, stitching and finishing seams in the most efficient way possible, she still talks about her even bigger dream. Sameeha wants to open a small factory of her own, employing other women who live at the refugee camp. She longs to draw on her years of experience to create a business of her own which also helps her neighbors. Those 4.8 million Syrian refugees, they are much like Sameeha. They are a wealth of skills and talents, hopes, and dreams. Collectively, they carry tens of millions of years of work experience. It’s hard to see beyond statistics like that. So instead, focus on Sameeha. You helped her with her business, and you helped her get another step along the way toward her dream. Give Syrian refugees a new beginning—and the tools they need to rebuild their future.